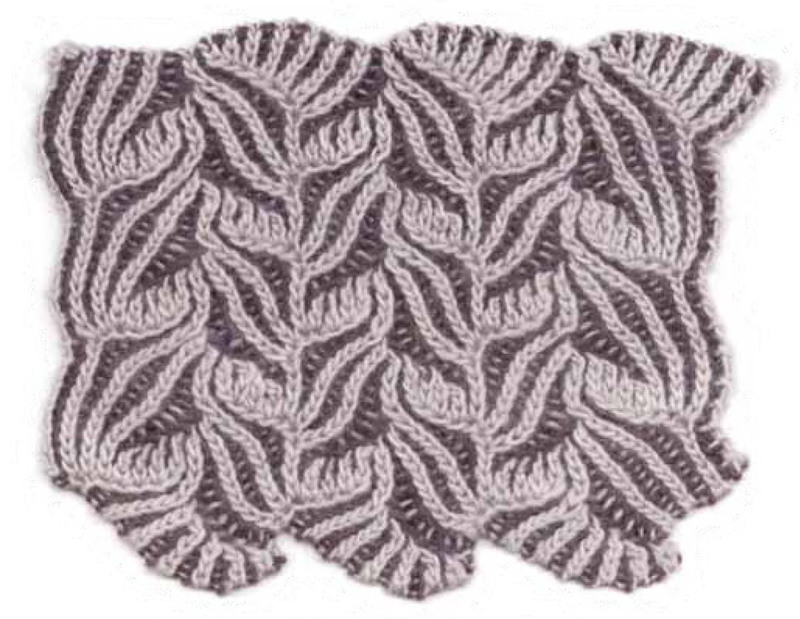 I think it's time to just come out and say it: Brioche is THE stitch for 2015. 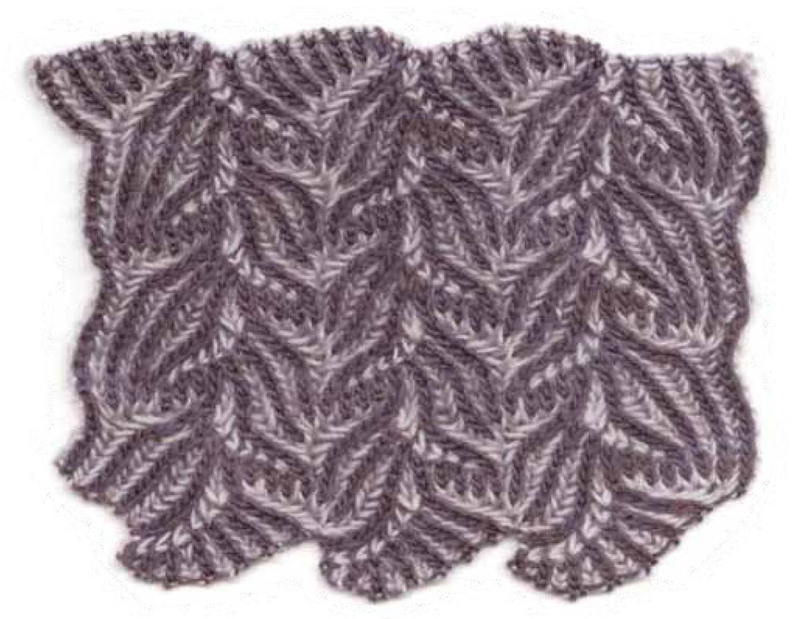 With new brioche designs coming out of the wood-work, brioche knit alongs, and now the latest, "Knitting Fresh Brioche" from the wonderfully talented Nancy Marchant, I've decided that 2015 is the Year of Brioche. Nancy's new book, "Knitting Fresh Brioche: Creating Two-Color Twists & Turns" is a wonderful resource for any knitter looking to knit this years trend. And the cover truly says it all - from the moment I picked up the book I knew I was going to have a plethora of options for two-color Brioche that would keep my fingers busy for months on end. The book is quite large, 236 pages of instruction and glorious full-color images that don't disappoint. Even the table of contents includes full color images of all 12 wraps and scarves projects included in the book. You can open the book and immediately choose what you want to see first. It's pretty awesome. New to Brioche? No sweat! If you've never knit Brioche before, the book includes full-color photo tutorials on casting-on, how to work the stitches, and even thoughtfully includes options for both Continental knitters and English/American Knitters (Throwers Unite!). I was pretty blown away by the work that went into just teaching a knitter how to get Brioche under way. And as any good teaching manual should, it includes a section on how to correct mistakes. Huzzah! Because really - who gets it right the first time? Page 74 - Staghorn: I'm not even sure I have the right words to express my reaction to this. The shape of it is stunning, and although these two colors are used on each sample of stitches throughout the book, these two colors combined with THIS pattern make me want to curl up with a good book about Dragons and Wizards and... well... Game of Thrones (and maybe a Whisky and a roaring fire for good measure). Page 86 - Optic Waves I: I want to make this. All the time. In blues. Living in SoCal I can imagine this worked into beach cover ups and romantic scarves for date nights watching the waves. Page 144 - Bart & Francis Compressed: this is a little slice of beautiful madness. Both the RS and WS look like art and the shaping created is stunning... and I just want to have it. Now. I think in soft browns and greens?! Stun. Ing! Pros and Cons? Not so much. The majority of the patterns are worked flat. There IS a short section in the Appendix that discusses converting projects into the round so it's not like you're left high and dry if you're an in-the-round person. I think starting Brioche flat is the way to go, there just aren't a lot of opportunities in the book itself to learn the art of Brioche-ing in the round. So... I guess there being a "con" is a moot point cuz it's really all in there. And lastly - the projects. OH the projects!!! I have one absolute favorite and it's not what I had expected it to be given how much I love the intricate pattern stitches. My favorite FAVORITE project is "Stegosaurus" on page 184. The lines are clean and show off the beauty of the yarn. The edging is gorgeous with the reverse color being the star. I dunno... it just speaks to me. Two other projects that really made me say "WOAH" both exhibit a similar color between the two yarns used in the pattern. In the "Ring of Fire" cowl, one of the only projects worked in the round, both the DC (Dark Color, what I would call the Main Color) and the LC (the Light Color) have a similar tone to them... bluey-red and purple. They work beautifully together to create a truly stunning project. The second "Woah" inducing project is "Sister Janie" on page 196. Similar to "Ring of Fire" the LC and the DC both have a purple base to them so it becomes almost like an optional illusion as to what you're looking at. All in all, I think "Knitting Fresh Brioche" is a wonderful resource for learning the art of Brioche knitting. There is a ton of inspiration that the knitter can use to turn into a project of their own. 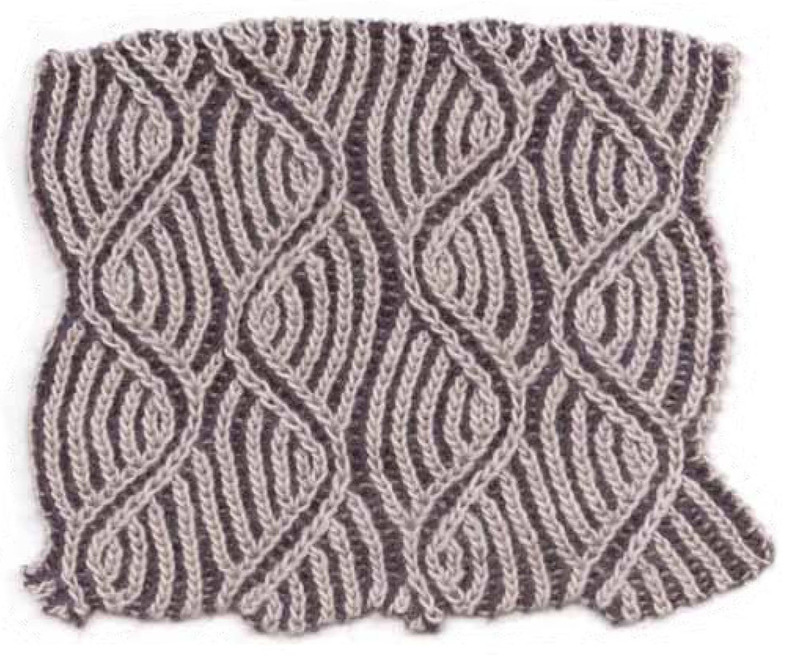 There's even a section in the Appendix that talks about how to design your OWN Brioche patterns - VERY cool! SO I'll leave you with this: go - go now! Get the book and start stitching up this years hottest knitting trend!